SHINGWAUK, GEORGE (Menissino, Menissinowinnini, also known as George Pine), Ojibwa chief; b. 1838 or 1839 at Garden River (Ont. ); d. there 13 Feb. 1920. George Shingwauk was the youngest son of the noted Upper Great Lakes Ojibwa chief Shingwaukonse (Little Pine) (1773–1854), a veteran of the War of 1812 who in 1836 had helped establish Kitigaun Seebee (Garden River), a thriving Ojibwa community on the north shore of St Marys River east of Sault Ste Marie. Shingwauk’s native name, Menissino, means “man of the island”; some Ojibwa speakers claim that it also denotes “great warrior” since a man with this name was viewed as capable of maintaining a relationship with powerful spiritual guardians. He eventually assumed the surname Pine, an English translation of Shingwauk, although he remained known locally as Menissino. A much older individual with this native name had accompanied Shingwaukonse to Montreal in 1849 to deliver a speech to Governor Lord Elgin [Bruce*] regarding native land rights. One wonders if this individual could have been Shingwaukonse’s son or son-in-law and George Shingwauk a grandson. Oral traditions at Garden River, however, state that George was indeed Shingwaukonse’s son and that he had an especially close friendship with his brother John Askin (Erskine) Shingwauk (1836–1919). Traditions also claim that John Askin’s mother, Ogahbageyhequa, Shingwaukonse’s fourth and last wife, was a devout Anglican. Since she was George Shingwauk’s mother as well, he may have received some schooling as a boy at the Anglican mission at Garden River [see Frederick Augustus O’Meara*]. In addition to Ojibwa, he mastered French but he never gained fluency in English. After becoming a chief, he had to rely on his better educated sons and nephews to act as interpreters, petition writers, and spokesmen when he needed to communicate with outside agencies. Since the births of John Askin and George Shingwauk occurred so shortly after their parents’ conversion to Anglicanism in 1833, during the deaconate of William McMurray*, the boys had respect for the Church of England ingrained in them early, though George Shingwauk later eschewed any form of religious bigotry. He married a Roman Catholic, Cecile Belleau, and strove to maintain harmony between Protestant Ojibwa and the sizeable Catholic Métis contingent who had entered the Garden River community after being driven from their homes at the Sault by non-native settlers. He would transfer this desire for a spirit of unity to his sons, William George Pine and Charles George Pine. At the same time he supported the educational activities of both the Reverend Edward Francis Wilson*, principal of the native residential school (the Shingwauk Industrial Home), and the Reverend Benjamin Fuller, one of his successors. Frequently invited to visit the Shingwauk home and the school for girls (the Wawanosh Home), George Shingwauk gave speeches that stressed the need for native youth to work hard to attain western knowledge and skills while holding on to cherished values that upheld the innate worth of all living things. He viewed western education not as an alternative to Ojibwa culture but as a catalyst for enriching native experience gained in the customary community milieu. George Shingwauk was first elected as a chief in 1899, at a salary of $100 per annum. By 1900 he was fulfilling roles as a traditional leader and an elected chief. Since Shingwaukonse’s death in 1854, positions of leadership had been held by close relatives. His successor, his son Augustan Shingwauk (Ogista, Little Pine), retained the head chiefship until his death in 1890; another son, Henry Buhkwujjenene (Wild Man), held it until his passing in 1900. In 1896 Jarvis Pine, Augustan’s eldest son, had become the first chief elected under the federal Indian Act. During his three years in office, George Kabaosa, a grandson of Shingwaukonse, acted as a political spokesman and George Shingwauk and John Askin Shingwauk began assisting with local affairs. For many years the Garden River Reserve retained these two systems of leadership – the traditional mode and the imposed elective type. The community also had to grapple with three thorny issues: native logging rights on the reserve, Sault Ste Marie’s covetous interest in the community’s land for municipal expansion eastward, and the illegal removal of high-grade gravel. George Shingwauk retained his elected office until early in 1902, during which time he received encouragement from Indian agent William L. Nichols, an exceptional man who helped the Ojibwa in their campaign to control natural resources by providing funds out of his own pocket. It is possible that Shingwauk had some money of his own to contribute since both he and his brother John Askin logged and farmed, and owned and mined locations in Duncan Township, north of Garden River. Nichols also aided the band in its negotiations with logging firms interested in taking timber off the reserve, among them the Harris Tie and Timber Company, Burton Brothers, and the Echo Bay Lumber Company. George and John Askin Shingwauk thus embarked on complex contract talks. The Department of Indian Affairs in Ottawa eventually became quite stringent about such independent business dealings by natives. In the band election of 1902 George Shingwauk was ousted by Buhkwujjenene’s brother-in-law, an astute political dynamo named Charles Cadotte, although Shingwauk retained his role as traditional chief. Cadotte and his council wrestled with the resource issues previously dealt with by Shingwauk’s council, particularly in respect of logging contracts. In September 1902 Cadotte’s administration finalized a contract with Burton Brothers to maintain logging berths set out by traditional native fiat, on terms agreed upon by the community but without Ottawa’s knowledge. The success of Garden River in such matters gradually encouraged neighbouring Ojibwa communities to emulate its political strategies. It is possible that such victories put Ottawa on its guard, however, since external agencies were clearly at work in the setting of a band election in 1903, only one year into Cadotte’s term. Cadotte proved a capable leader, but he suffered from unwelcome interventions by the local Catholic priest, Gaston-A. Artus sj. Artus had earlier proved to be of considerable political assistance on resource matters to Chief Jarvis Pine, a Catholic, but, unlike his clerical predecessors, he branded the Anglican Ojibwa leaders as agents of corruption and so alienated some of Cadotte’s Protestant followers. The sudden death of Cadotte’s main supporter (Joachim Biron) in the midst of the leadership campaign of 1903 also impeded his cause. Backed by his brother-in-law Michael Belleau, his brother John Askin, and two influential Métis, John Corbiere and Theophile Boissoneau, George Shingwauk won by 40 votes. During the campaign he had received support from Protestants and Catholics, despite the fact that Artus unjustly denounced him as an unprogressive politician. This opposition was a hindrance, but George Shingwauk refused to be disheartened. There were major challenges for Shingwauk’s council to surmount, most notably the limitation of encroachments by modern capitalist society. In 1906 the Algoma Advisory Union (the precursor of the Sault Ste Marie Chamber of Commerce) used the Ojibwa’s failure to cultivate large prosperous farms as an excuse to petition Prime Minister Sir Wilfrid Laurier* for the expropriation of the Garden River Reserve. In response, George Shingwauk led a delegation composed of John Askin Shingwauk, Alex Wabanosa, and William J. Pine to Ottawa to present a petition aimed at thwarting the union’s plans. Minor victories ensued. After sending additional petitions to Ottawa, the Garden River band received a ruling in 1910 prohibiting the municipal expansion and one in 1914 exempting the Ojibwa from having to contribute labour or funds for the construction or maintenance of a trunk road through their reserve. Further, they secured acceptance of their condition that, should the road cease to be used for public conveyance, the land allowance would revert to the band. Another issue had been settled in 1913 when the Canadian Pacific Railway awarded the community $5,282, less legal costs, for gravel it had taken. Fortified by this partial success – the payment was low – the band would negotiate a better contract in 1914, when George Shingwauk was in his seventies. In this second agreement, which related to a quarry at the Buhkwujjenenewabick (wild man’s stone), a trap-rock bluff in the centre of the reserve, the Ojibwa received guarantees of employment, including insurance benefits, and assurance that the boundaries set by the chief would be respected and that the site, when it ceased to be used for quarrying, would revert to the band. Native values pertaining to resource use, notably group ownership, were also preserved. In 1914 and 1915, during World War I, the band rejected a plan to establish a prison farm on 4,000 acres of its territory. In 1916 George Kabaosa, who had become the most active and daring of Garden River’s politicians, won election against George Shingwauk despite his successes. Indian Affairs immediately, and unfairly, branded Kabaosa a troublesome agitator and nullified the result. The politically palatable George Shingwauk then regained the leadership. No firebrand, he had emerged as a gracious and dignified figurehead who saw himself as a loyal subject of the crown, a member of the king’s church, and an advocate of continuity and tradition. He nonetheless promoted progressive change within his community. Surreptitiously he encouraged Kabaosa to continue his trenchant complaints against encroachments on native lands and resources. Within Shingwauk’s council, younger members learned new ways of defending native prerogatives as the old style of oratory, replete with metaphor, gave way to succinctly worded petitions punctuated with legal terminology. These became necessary as greater interference from government occurred in the years following the war and they helped ensure Shingwauk’s retention of power until his death in 1920. By 1900 George Shingwauk had become one of Garden River’s most effective supporters of native rights, as well as an advocate of religious harmony at a time when interdenominational strife threatened to tear some native communities asunder. On his death, the local Indian agent, Alexander D. McNabb, wrote, “The late chief was a good man, I consider [him] the best man on the Garden River reserve, always on the side of justice. . . . [H]e was not an aggressive chief, I always knew he would be found willing to help in all good for the benefit of the Band as a whole.” Though at times poor in material goods, he left a rich heritage. His outlook and values were remembered by Ojibwa leaders throughout the Upper Great Lakes district, and his sons and daughters became respected members of the Garden River community. Charles G. Pine was the rector’s warden at St John’s Anglican Church for many years, as well as a delegate to the Algoma diocesan synod. 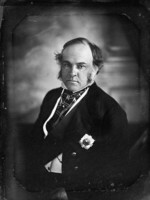 William G. Pine, who inherited his father’s bent for politics, served several terms as chief. J. E. Chute, The legacy of Shingwaukonse: a century of native leadership (Toronto, 1998). Janet E. Chute, “SHINGWAUK, GEORGE,” in Dictionary of Canadian Biography, vol. 15, University of Toronto/Université Laval, 2003–, accessed April 26, 2019, http://www.biographi.ca/en/bio/shingwauk_george_15E.html.